HOUSTON – The Texas Southern Lady Tigers played outstanding defense and with high energy as they captured a season finale home victory over Alcorn State with a final score of 70-43. 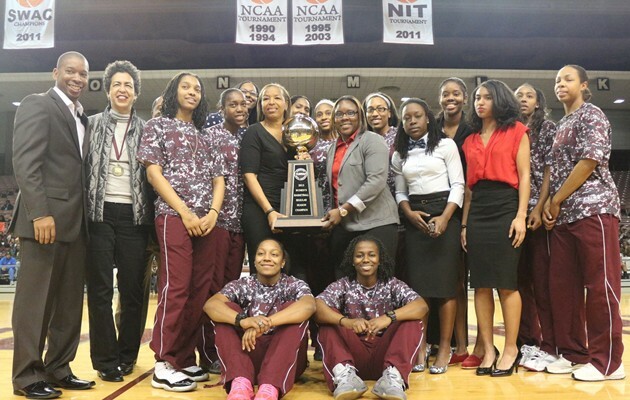 On a night in which the Lady Tigers were presented with their championship trophy TSU played stellar basketball as they now get set to look ahead towards the 2013 SWAC Tournament. After tying the game at 2-2 the Lady Tigers kept the Lady Braves scoreless for the next 14 minutes of play. Alcorn State got a bucket late in the half but the Lady Tigers had reeled off 21 points in that time span to take a commanding 30-7 advantage going into the half. Texas Southern held on to the momentum in the second half as they continued to play solid defense while getting points on the offensive end of the floor. The Lady Tigers collected 17 steals during the game led by Brianna Sidney who had 18 points and 5 steals. Te’era Williams contributed with 16 points and 2 steals helping lead TSU to its 15 win in 16 outings. Morgan Simmons scored 11 points for Texas Southern while also grabbing seven rebounds. After the game the Lady Tigers basketball program honored four seniors who had played in their final home game. Jasmine Quinones, Frantz Mueller, Brijan Turner, and Gianne Fleming were each greeted with enthusiastic applause from Texas Southern’s fans as they were recognized for their contributions to the program. Texas Southern dominated second chance points in the contest 21-to-3. The Lady Tigers played well inside the paint collecting 42 points to Alcorn State’s 20 points. Texas Southern also scored 29 points off of Lady Braves’ turnovers. The Lady Tigers will get set to travel to Dallas, Texas for the 2013 SWAC Basketball Tournament. Texas Southern will face the winner of the #8 versus #9 opening round game. Texas Southern will hit the hardwood in tournament action on Wednesday, March 12 at 5:30 pm. The Lady Tigers enter the SWAC Tournament as the number one seed. Head Coach Cynthia Cooper-Dyke is one victory away from reaching 150 wins as a coach. The Lady Tigers said goodbye to four seniors as they played their final regular season home game. Texas Southern set school records for wins (19) and consecutive victories (15).